Click the video link to hear Martin’s story. Our specialist brain injury solicitors have over 25 years’ experience in achieving strong results in complex claims involving adults and children with brain injuries. Inappropriate medication or taking the wrong dosage of medication. Every brain injury claim is unique and the impact on an individual will depend on the type, location and severity of their injury. Whilst some will make a partial or complete recovery, others experience permanent and profound disability. Brain injuries have serious consequences for both the injured person and their loved ones. No amount of money can ever truly provide adequate compensation for the devastating effects of a severe head injury. However, compensation can help you to manage the consequences by funding much needed care, treatment and therapy, alleviating financial hardship and improving quality of life. To hear how we helped Martin with his complex brain injury claim, click the link in the banner image above. This brief guide explains the different types of injuries that can occur, along with an explanation of the effects on different functional areas within the brain. 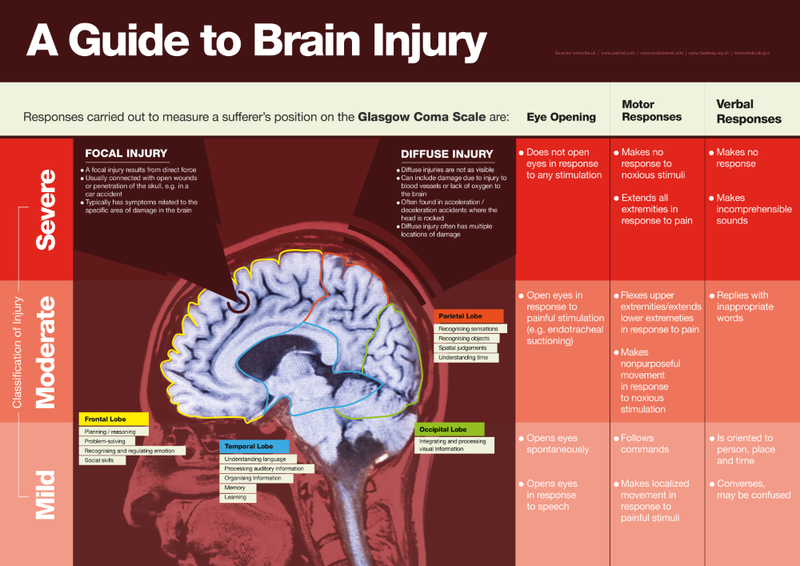 It also displays the Glasgow Coma Scale – one technique used by medical professionals in order to classify the extent of injury caused based on an individual’s motor responses, verbal responses and ability to open their eyes in response to stimuli. Please click the image to see it in full size.